In this down-economy, with wage freezes and zero bonuses, the reward for working hard these days is getting to keep your job! With the high number of layoffs, keeping your job also means taking on responsibilities of the employees that were layed off! Corporate executives don’t seem to be affected by these same afflictions as they enjoy salary increases and bonuses that would equal and exceed your annual income. The corporate work environment has become one based on fear, instead of encouragement, positive thinking, and innovative ideas. Workers fear that their job will be the next to go so they just shut up and do what they are told. Fun times! With all this happening around the country, a recent study showed that 84 percent of employees HATE their jobs. What a surprise! These job haters are taking action and looking for other work! 84% is a huge number! You can read the full story here at CNN Money and get all the facts! The problem with looking for work is that even if you find another job, eventually it will be the same exact situation, just different people to deal with and different colored cubicles. 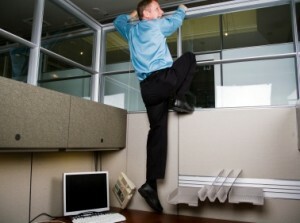 I call it “stuck in a cubicle” syndrome. Sure, you may get a little more money when you switch employers or maybe NOT in this economy! The only way out of this Catch 22 is to own your own business where YOU are in control of your income! Are you ready to make a change? Because Corporate America will never change! You can start your own business while keeping your day job. If you are serious, eventually your part-time income will exceed the crappy pay you get at your day job. You need your own business! Click here to find out how to help others get health and fit while earning a income!